Sharp Corporation has developed the LR0G951 and LR0G952 modules for digital signage players that do not have a PC unit to display digital signage content. These new modules, which integrate the main features of a digital signage player on one main circuit board, will allow manufacturers to develop and commercialize standalone devices in the shortest time possible. Each module consists of a main circuit board, a remote controller receiver board, and a remote controller. 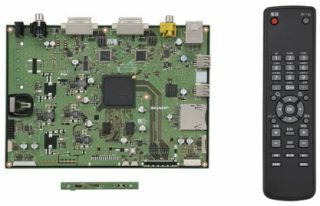 The main circuit board incorporates Sharp’s newly developed dedicated graphics engine, which eliminates the need for the PC unit used in conventional digital signage systems. This “PC-free” design provides for simple, convenient operation that enables power to be turned on and off without having to start up or shut down a PC, while also reducing power consumption. The graphics engine also enables a variety of animation effects with full-HD still images displayed as motion images. In addition, these modules are equipped with functions that allow the user to easily edit the content displayed on a digital sign by using only the remote controller. In a restaurant, for example, software bundled with the modules allows the user to create digital content such as menus and prices. Using just the remote controller, restaurant personnel can easily switch among the prepared content. Being able to update display content without using a PC broadens the range of applications for digital signage. 1.Modular design enables manufacturers to develop and commercialize standalone PC-free digital signage players. 2.Eliminating the need for a PC unit makes operation simple and convenient and reduces power consumption (10 W). 3.Dedicated graphics engine enables display of full-HD still images as motion images. 4.Easy editing of display content using the remote controller—an industry first.